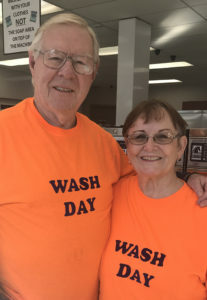 Sporting bright orange T-shirts with the words “WASH DAY” on them, Bob and Virginia Widing are easily identified at Silverton’s Laundry Depot. Since last May, the Molalla couple began showing up at the laundromat every other Tuesday afternoon from 12:30 – 4:30. They welcome area homeless attend to washing and drying their own laundry. Quarters aren’t required. Instead, the couple came up with a novel idea: tokens. Plastic coin-shaped tokens are issued in advance to recipients, who are pre-screened at SACA. Looking like poker chips, tokens are red, white or blue. The red ones are issued from Cherry Hoffman at First Christian Church, the white ones come from SACA, and the blue ones come from Sarah White with Silverton’s Sheltering Services. “Bob Widing brought me tokens. Pastor Knox and I were really excited about it and we got on the bandwagon right away,” Hoffman said. As co-founder of the church’s Wednesday Night Free Community Dinners, which began filling plates in 2008, Hoffman “wears many hats” and is pleased to continue to help wherever there’s a need. The process is simple. The clients come to the laundromat and show the Widings their pre-issued tokens. The tokens are not collected, they simply serve as identifiers that the recipients are invited to use the facility. “We got the orange T-shirts so they could spot us here at the laundromat,” Virginia said. Bob, 77, and Virginia, 76, have been married 56 years, have three children, 12 grandchildren, and six great-grandchildren (with another on the way). Stepping up to help organize a new outreach program was natural to them. “We both volunteer at SACA on Tuesday nights. SACA supplies the food, and Sarah White works with the homeless. The one thing they didn’t have was a clothes-washing program. So, we thought ‘we could do that,’” Bob explained. “I’m so thankful that we have done it because we’ve had people come in that have cried, telling us they’re so grateful they can do their laundry,” Virginia said, adding she recently noticed somebody had six loads to wash.
“A lot of times people come in to wash their blankets, the ones who sleep outside,” Bob added. The couple gives full credit to community donations, which continue to grow. “Sarah White recently bought us four donation boxes to place around town. Every donation goes into a specific account so there’s accountability. All the monies donated go into this program to buy the laundry soap, etc.,” Bob explained, adding they will continue their part as long as possible. “I love these people, it’s a blessing,” Virginia said. To donate to the “Wash” program, contact Virginia Widing at 503-829-8048.